I’ve been lying you—by omission, yes, but that’s still disingenuous– for almost a week, and now it’s time to come clean. I’ve been in Florida, where Mr. Karen and I spent five days visiting his parents. They’re fortunate to have the use of a house down there in the winter (and a long winter it is, too, stretching about eight months), and we’re fortunate to be able to go see them. Every year we say to ourselves that we’d better take advantage of the opportunity because we don’t know how many more times they’ll make the trek down there; I think we’re now on our six or seventh iteration of that particular rationale for taking a winter vacation to a warm place. Because this visit fell over Christmas, our time together was a little more hectic than some of our visits have been, but we still managed to have a good time. We left Thursday night, late enough so I didn’t feel all stressed and rushed trying to get out of the office in time to make it to the airport. Finishing up my last minute packing, I realized I’ve become one of those people, the ones who bring so much stuff with them that it’s almost like they never left their home and office behind. I had my work cell phone and charger, my laptop and its power cords and external mouse, my digital camera with its battery charger and AC adapter and USB cable, and the film camera and its tripod and extra battery. About the only thing I left behind was my electric blanket. Walking through the airport to our gate Thursday night, I realized if I’m going to be one of these people, I really need to get a wheeled carryon bag like the rest of my new tribe. The flight down was uneventful but still reminded me how much I hate flying. Well, no, it’s not the flying— it’s the other passengers, with their overstuffed bags and inability to follow directions about when to board and general disregard for their fellow travelers. These are the same people who stand slack jawed right up next to the baggage belt, evidently believing this will make their suitcases appear faster and effectively blocking access for people whose bags are there. I was looking forward to sleeping in on Friday, but I’d forgotten that the guest room at my in-laws has the stabbing rays of morning light feature, not a plus for someone like me with thin eyelids. On most trips, the freebie sleep mask Mr. Karen got on one of his international flights years ago works fine, but this room really requires my super duper Swedish miracle foam version, which unfortunately I’d left at home. We blocked off the gaps between the window and the vertical blinds as best we could with a combination of Prevention magazines, concert programs, and paperback books, but the light still snuck in and woke me up way too early for a day off. Still, it wasn’t all bad, because being the first one up meant I could write my morning pages in peace and quiet without worrying about being antisocial. Friday’s main event was Mr. Karen’s and my first trip to a dollar store. Yes, I know that dollar stores are not a new phenomenon, but somehow we’d managed to stay out of them. We ended up spending a long time in the store, goggling at all the different things they were selling for only $1 (and in some cases, two or even three for a dollar). Things I hadn’t even known I wanted became almost irresistible when they were only a dollar. I spent a long time by the sticker display, thinking about decorating the pages of my scrapbook with the Colorado stickers or the skiing ones or the hearts and stars—except I don’t keep a scrapbook. We wondered how they managed to sell some of the things so cheap, and whether they could possibly be what they appeared to be. When we finally left, we’d spent $17 on two bags of stuff. I’m thinking there will be more dollar stores in our future. Saturday’s big accomplishment was bathing suit shopping. Acting on a tip we’d gotten at dinner the night before, my mother-in-law and I started at a little outlet store tucked into the corner of a strip mall. They had lots of suits to choose from, and Joan waited patiently while I tried on bunches of them and then went back to the racks to find even more options. Some of them were too indecent or too unflattering for me to even want to venture the few feet outside the dressing room cubicle so Joan could see them, but eventually I narrowed it down to two I liked and thought looked good. I ended up buying one of them, and Joan got the other one for me for Christmas. For bathing suit shopping, it was pretty painless. Just for comparison’s sake, we moved on to some more expensive stores to see what they had, and I’m pleased to say we didn’t find anything we liked better. Sunday, my new outfit made its debut at church. Until a few days before we left, I thought perhaps I could wear the red suit that’s been languishing in the back of my closet since I was last thin enough for it to fit. When I dug it out to try it on, though, I found it still doesn’t fit, and I was very surprised to see that it’s a size 8. Granted, women’s clothing sizes being what they are, that doesn’t necessarily mean it’s tiny, but still, I had forgotten I had anything in a single-digit size. Given the space between the button and the button hole on the skirt when I tried to bring them together, I must have bought this when I was at my absolute lightest the first time I did Weight Watchers. I’m not sure it’ll fit when I’m 140, but I’ll keep it around until I am (or until I decide I’m not going to be). My red suit plan foiled, I took advantage of a pre-Christmas sale at the dying outlet mall by a customer I had to visit last week and bought a three-piece knit outfit perfect for squashing into a suitcase: a long black skirt with a caramel jacket trimmed in black and a matching sleeveless shell. I got a little thrill out of it being from the regular sizes section of the store instead of the plus sizes corner, and a bigger thrill out of it being on sale for $29.99. Caramel is not one of my best colors, but since everything else was right, I can live with it. Mr. Karen and I finally got to the beach on Sunday afternoon. The weather cooperated beautifully; it was sunny and warm enough to wear bathing suits instead of the tee shirts and shorts and even jackets we’ve had to don on some of our past visits. After walking a short way up the beach, I regretted not bringing at least one of our cameras. There were all sorts of interesting things on the sand, including sea urchins and some bright orange blobs that could have been animals or plants. 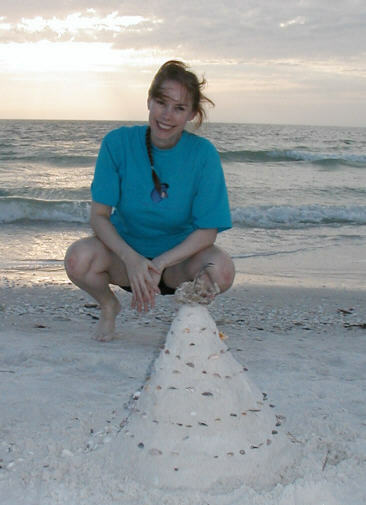 There was also an elaborate sand castle featuring a wooden snowman figurine standing guard at the top of one of its towers. We ended up walking about two hours, down to the end of the sand and back, picking up a few shells to add to our collection along the way. We’d hoped to catch up on our movie watching while we were on vacation, but it wasn’t until Monday afternoon that we made time to go see Treasure Planet. We started with that one because of all the films on our list, it seemed the most likely to disappear from theaters. We enjoyed it, as we do most Disney movies (now that I’m a grown up, the scary parts are easier to handle). Mr. Karen thinks it would be doing better if had a different title and marketing plan. The people who know the story of Treasure Island are mostly too old to enjoy a film whose main character is essentially a snowboarder. On the way back from the movie, we stopped at the Samsonite outlet and I became the proud new owner of a small plum-colored wheeled carryon. We also got a matching check through duffle, since it was marked way down and filled a gap in our luggage wardrobe and wouldn’t be a hassle to get back because we’d only checked one bag between us on the way down. Tuesday, Christmas Eve, we opened our presents after lunch. That’s not traditional, but it seemed like the best time to do it, and maybe we started a new tradition. Trying to do it Christmas morning would have meant having to rush through in order to leave enough time to pack and get to our plane home, and we didn’t want to have to try and squeeze it in between Christmas Eve church services or wait until after the last one ended near midnight when we’d all be tired, so after lunch it was. After presents, Mr. Karen and I headed for the beach again. It wasn’t quite as warm and sunny as it had been on Sunday, but it was a lot less crowded. We amused ourselves by building a Christmas tree out of sand and decorating it with the raw materials at hand, namely seashells, a sponge and a feather. Despite the wind and the encroaching darkness, I was pretty happy about the whole outing. After dusting the sand off ourselves and having dinner, it was time to head off to church; even though we’re related to the seasonal associate pastor, Mr. Karen and I only went to the middle of the three services. It turned out to be the most eventful I’ve ever been to. During the sermon, a man near the front of the congregation suddenly stood up and started talking in an agitated voice. At first it made no sense— I couldn’t tell if he was heckling the minister or suffering from Tourette’s or what– but soon it became clear that someone in that pew was having a medical problem. Cries of “call 911” could be heard and there was a flurry of activity around the fallen woman, who was the five months pregnant wife of the panicked man. The pastor did a great job handling the situation; she designated one person to go out and direct the emergency personnel to the sanctuary, had the organist start playing so the discussions between the family and the people in the congregation who came over to help (a paramedic, his daughter who had just completed her paramedic training, and a nurse among them) could be conducted without everyone listening in, and reassured the congregation from the pulpit before moving down to talk to the family herself. The rescue squad arrived in just a few minutes and loaded the woman onto a stretcher and wheeled her out of the church. The pastor resumed her sermon, but made sure to incorporate her conversation with the stricken woman so the people who hadn’t been able to see that she’d revived wouldn’t have to wonder, and at the first opportunity later in the service led the congregation in prayer for the woman and her family. By the end of the service, all was calm again. I wish the people I know who believe women shouldn’t be ministers could have seen how well this one did under pressure. Christmas morning we packed our suitcases—somehow managing to fill both the one we’d come down with and the new one—and had a big breakfast before heading off to the airport. There we got the best present of all; the flight home not only left on time, but it was only half-full, so Mr. Karen and I had three seats for the two of us. Ah, luxury. Our good travel karma continued in Detroit, where our suitcases were among the first onto the belt. We were out of the parking deck and on the road about a half hour after our plane got to the gate. If only elves had come to shovel the five inches of snow that had fallen on our sidewalk and driveway while we were away, the day would have truly been magical. The trustworthy people on my notify list were in on the secret all along.